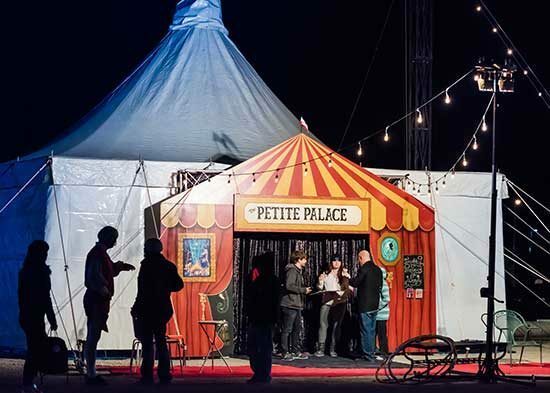 For the first time in North Texas, the Laughter League and The Petite Palace are coming together to create an intimate, eclectic tent show that will take audiences on an unparalleled journey, which combines the dazzling, daring aura of Cirque du Soleil with the madcap mirth of Saturday Night Live. And, special guest stars including Magic Mike Williams, Choreo Tap Company and more! Friday, October 5 at 7:00 p.m.
Saturday October 6 at 1:00 p.m., 4:00 p.m. and 7:00 p.m.
Sunday, October 7 at 2:00 p.m. and 5:00 p.m.
Friday, October 12 at 7:00 p.m. and 9:30 p.m.
Saturday October 13 at 1:00 p.m., 4:00 p.m., 7:00 p.m. and 9:30 p.m.
Sunday, October 14 at 2:00 p.m. and 5:00 p.m.
Thursday, October 18 at 7:30 p.m.
Friday, October 19 at 7:00 p.m. and 9:30 p.m.
Saturday October 20 at 1:00 p.m., 4:00 p.m., 7:00 p.m. and 9:30 p.m.
Sunday, October 21 at 2:00 p.m. and 5:00 p.m.
Tickets prices for The Petite Palace are $30 for adults and $20 for kids (ages 2-12). To purchase tickets, visit www.LaughterLeague.org. For more information, visit www.LaughterLeague.org. Want to win tickets to see Petite Palace next weekend? North Texas Kids is giving away 4 tickets to the 1:30pm performance on Saturday, October 6. To enter, just leave a comment below about what your favorite part of a circus show is. Contest ends at midnight on Wednesday, October 3rd. Be sure to provide a valid email. Winners will be contacted via email on Thursday, October 4th. My favorite part is usually acrobatics. Circus is full of colorful mystery and fun. True shows of people that you are mesmerized to watch. 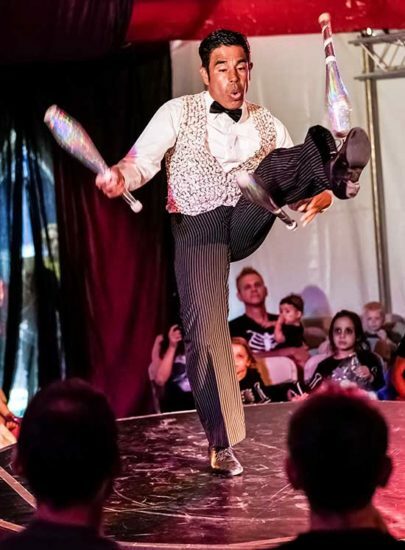 My favorite part of the circus show is jugglers, they always amaze me with their talent!! My favorite part of the circus is hearing our girls ooh & aah over the acts. We especially enjoy the aerial acts or anything with dogs/cats. The glitzy costumes are a bonus. The thrill of seeing all of circus acts. But the most amazing thing about the circus is the acrobatic acts that are performed by those professional people. The clowns, the animal acts are all terrific. My granddaughter who loves the circus, says that her favorite part of the circus is being able to ride on the elephants. So much fun she says! My favorite part is how the performers connect with the crowd and get us involved! The circus is so much fun and interactive! My favorite part of the circus is the acrobatics! Magical acrobats~ animal shows~ dazzling costumes~ fun for the family ! My favorite part of the circus is the suspense, risks and thrill of the acts. The best part is anything with animals, especially rescue animals! My favorite part of the circus is the constant excitement of what’s going to happen next and the awe in my children’s eyes as they watch the perfomances. Acrobatics are my favorite part of the circus! My favorite part of the circus was the extra-ordinary of it all!